Thinking about something a friend said about being an expat — that it will ultimately lead you to feel that you belong nowhere. He meant that it’s a form of freedom — that when you have no country or culture to be tied to, you can simply be who you are, wherever you are (shades of Buckaroo Banzai, I know, but there’s a reason why that expression took off like fire the moment we left the theaters in 1984). I don’t know how long I’ll live here, but I know that whether I live here, or back in the US, or somewhere else, I will feel this same rootlessness, which often translates to restlessness — to wanting to be one of the birds. It would make more sense to be one of the birds, swirling overhead, alighting and then moving on. That is a lot of what happens to me, on the bike, the chasing of that desire, or simply being propelled by it. Something indefinable, but so strong that when I try to sit still through it, I feel like a tin man whose layers are falling off, decayed sheets of rust flaking down. I cannot abide that, so I get up, I run downstairs, I unlock the bike. The birds swirl overhead. I saw a group of seagulls needling a single crow today. I saw a strange, small, crested waterbird hustling along the ground. I saw a black duck killed by a car, its bloody remains sprawled across the ground. I saw two huge storks in the distance. 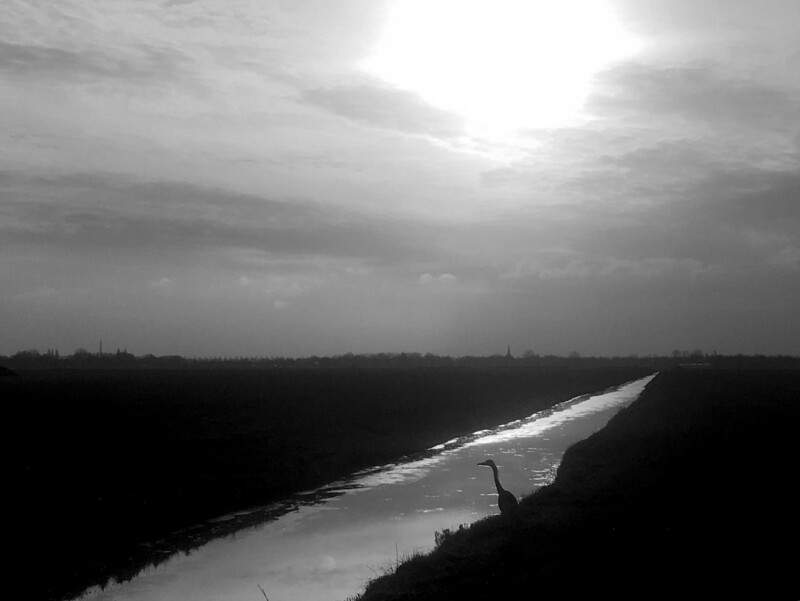 I saw the herons, always the herons. I startled one in the ice, and the sudden scratching as it took off startled me in return. There were more egrets than usual. I saw a photographer, pointing a long lens out the window of a car at them. I don’t fit, but then maybe neither do the birds. They are not really part of either earth or sky. They have territories they haunt. They migrate, moving to where it’s warm, or where the food is plentiful, or where there is a good spot to lay some eggs. Maybe I need to look at my own migrations that way. Here, right now, is a good spot to lay some eggs.